Foundation project: This study is part of the project: Study on immune response pattern of cattle vaccinated by Razi pasteurellosis vaccine (Project number: 12-18-18-9458-94014). Pasteurellosis is one of the most important health problems in domestic animals, and it is caused by Pasteurella multocida (P. multocida). It has been reported as a transmissible disease in wild and domestic animals. P. multocidais a small, pleomorphic, Gram-negative coccobacilli,. Despite the high prevalence of Pasteurella species in wild and domestic animals, the relatively low incidence of human pasteurellosis, the presumption is that P. multocida is an opportunistic pathogen for human,. Changes in clinical symptoms in pasteurellosis can be explained by changing the relationship between host and bacteria. Zoonotic transmitted to humans through insect bites or contact via nasal discharge usually done with P. multocida is the most common infections in human. Vaccination is now an important method to prevent pasteurellosis. Conventional vaccines have been used for pasteurellosis for decades. However, these vaccines are inefficient in cross-protective and long-term immunity. An inactivated vaccine is a vaccine containing bacterial particles that have grown in culture and then are killed using a method such as heat or formaldehyde,,. Some heavy metals are required by the organisms as nutrients, and metals play an important role in the metabolism of microorganisms. The capability of pathogens to receive iron is one of the key characteristics during the course of the infection. However, heavy metal ions like high-concentration iron create toxic compounds in bacterial cells and can be used as inactivating agents to kill bacteria in vaccine preparation,. In order to achieve long-term protection against infection with the inactivated vaccines, there is often a need to add an adjuvant. Adjuvants are compounds that increase the specific immune response to common antigens, and the adjuvant word is derived from the Latin adjuvare word. The deliberate selection of adjuvants can affect the apparent aspects of antibody responses such as dependence, class, isotype, and epitope specificity. Therefore, it is very important to develop new immunological adjuvants with high efficiency, vast resources, and low toxicity. As a result, more effective and safer adjuvants suitable for use are needed. Due to the capacity of their immunostimulatory ability, bacteria-derived substances are major sources of potential adjuvant. Bacterial components are often powerful immune activators but are usually related to toxicity. For example, bacterial DNA (bDNA) is one of the strongest cellular adjuvants. At present, it is known that, DNA and RNA cause native immune responses such as interferon type I and inflammatory cytokine production. Interestingly, native immune activation of DNA is influenced by the structure and compatibility of DNA,. Therefore, DNA vaccines include a “Made-in” adjuvant, a CpG motif. In fact, the addition of several CpG motifs to DNA plasmids led to improved immunization of DNA vaccines. bDNA creates cell-mediated immunity by Th1 cells. It indicates an increase in interferon- γ through binding to the toll-like receptor 9, which is used to detect pathogen-dependent molecular patterns,. The CpG motif also secretes inflammatory cytokines such as interleukin (IL)-6, IL-12, and tumor necrosis factor α. IL-12 causes differentiation of Th0 cells into Th1 cells. In addition, tumor necrosis factor α is secreted from dendritic cells. It activates both the natural killer cells and the natural killer T cells. Therefore, the present work was conducted to evaluate the protective efficacy of several bDNAs during injection by subcutaneously injection method alone or in composition with the inactivated P. multocida vaccine against an experiential challenge in mice with P. multocida specific strain. This study was conducted based on serological research. Also, here we compare the use of iron as an inactivated agent instead of formalin to prepare the killed whole-cell antigen. All clinical investigations were conducted according to the principles of the Declaration of Razi Institute. The study was approved by the local ethics committee (Project number 9458-94014). In this study, 64 female Balb/c mice weighing 16–18 g body weight were used. They were prepared by Animal House of the Razi Vaccine and Serum Research Institute in Shiraz, Iran. The bacterial inspection showed that the mice were free from P. multocida infection. P. multocida specific strain PMSHI-9 (GenBank accession no. JF694004.1) from RVSRI, Shiraz, Iran was obtained as a lyophilized ampoule. It was activated by culturing in blood agar (Merck) culture and incubated at 37 °C for 24 h. For broth cultures, P. multocida strain was inoculated in brain heart infusion (BHI) (Merck) broth and incubated in a shaking incubator (IKA, KS4000i) (100 r/min) overnight at 37 °C. To calculate median lethal dose (LD50), P. multocida was grown in BHI broth, inoculated in Balb/c mice, and the microorganism was re-isolated from the liver of killed mice on blood agar plate. P. multocida colonies were suspended in normal saline, and their density was 1.5×107 bacterial cell/mL. The suspension was used to test the challenge. The FKA was prepared from P. multocida specific strain. The typical colony of P. multocida isolated from the blood agar plate was removed, and the organisms were grown overnight in BHI broth at 37 °C. Then 1 mL of bacterial growth was obtained further inoculated into 50 mL of BHI broth at 37 °C for 24 h. Finally, the growth of the bacteria was expanded by inoculating 20 mL in 1 000 mL of BHI broth at 37 °C for a maximum of 24 h as a stationary culture. The bacteria were pelleted at a temperature of 4 °C for 30 min at 3 500 r/min and were washed twice with the sterile normal saline solution (NSS). The pellet in the NSS was re-suspended to a final volume of 20 mL. Culture purity was assayed by Gram's staining. For the preparation of IKA, the organisms (P. multocida specific strain) were grown for 24 h in BHI broth, and the bacterial cells were harvested in NSS. The purity of the culture was tested by Gram's staining. The bacteria were killed by adding 1 mol/L FeCl3 into bacterial culture up to a final concentration of 10 mmol/L and incubated at 37 °C for 4 h by alternating shaking. Suspension sterility was investigated by inoculation of 200 μL suspension in the nutrient agar, which showed no growth. The cell suspension was centrifuged for 15 min at 1 000 r/min and subjected to two items of washing with NSS. The bacterial sediment was suspended in NSS and this preparation was designated as IKA,. bDNA from P. multocida A strain, P. multocida B strain and Salmonella typhimurium (S. typhimurium) was isolated by the phenol/chloroform method outlined by Cheng and Jiang. This DNA extraction method is a corrected method of phenol/chloroform standard method. They lysed cells directly by phenol and eliminated the lysis step that uses SDS/lysozyme. In this method, Tris-saturated phenol was added to the tubes, followed by a vortex-mixing step to lyse cells. RNA was digested by RNase in DNA preparation and DNA was better purified by repeated treatments of chloroform. Finally, pure DNA was precipitated by use of 2 volumes of cold ethanol, pelleted, air dried, re-suspended in endotoxin-free water and stored at -20 °C up to further use. The purity and yield of the DNA by spectrophotometry was performed by calculating the A260/ A280 ratios and the A260 values for determining the protein impurity and DNA concentration respectively,. P. multocida A strain genomic DNA, P. multocida B genomic DNA, and S. typhimurium genomic DNA were designated as AbDNA, BbDNA, and SbDNA, respectively. This experiment was performed at House Animal House Laboratory, RVSRI, Shiraz, Iran. The mice were in a separate cage. Animals were divided into eight equal groups (eight in each group) only treated with bDNA or combined with formalin- and iron-inactivated P. multocida vaccine. FKA was adjuvant with 0.5% aluminum potassium sulfate and this experimental vaccine was designated as FKA-Alum. IKA was adjuvant with bDNA and the experimental vaccine was designated as IKA-bDNA. To prepare FKA-bDNA, FKA was with adjuvant with genomic DNA (bDNA) and the experimental vaccine was determined as FKA-bDNA. The immunogens on day 0 (a single dose of 1 mg in 0.2 mL per mouse) were administered. The pure bDNA was mixed as an adjuvant in FKA and IKA, or only 5 μg in the final volume of 0.2 mL of each inoculum. Treatment of different groups of mice as follows: group (I) was injected subcutaneously with 2 mL sterile PBS and kept as normal control, group (II) was injected subcutaneously with a single dose of AbDNA, group (III) was vaccinated with FKA-Alum vaccine, group (IV) was injected subcutaneously with FKA-AbDNA, group (V) was vaccinated with IKA-AbDNA vaccine, group (VI) was vaccinated with IKA-BbDNA vaccine, group (VII) was vaccinated with IKA-SbDNA vaccine and group (VIII) was vaccinated with IKA alone without any adjuvant kept as adjuvant control. Controls and vaccine treatments were repeated after 2 weeks (day 14) in all groups as a booster dose. Testing continued for 4 weeks, at the end of which challenge was carried out by injection with a virulent strain of P. multocida. The mice were bled from the day 28 after the first injection. Specific antibody levels of P. multocida were tested by ELISA using sera from each animal of various groups, as previously described by Bacelo et al. Briefly, polystyrene 96 well immunoplates (SPL, Korea) were coated with 200 ng of P. multocida PMSHI-9 antigens per well, diluted in carbonate-bicarbonate buffer pH 9.6, and incubated overnight at 4 °C. The plates were washed one time with PBS–0.05% Tween 20 and were blocked with 100 μL of 1% bovine serum albumin at 37 °C for 1h. After washings three times with PBS–0.05% Tween 20, the mice serum (diluted 1:50) was added and the plates were incubated for 1 h at 37 °C. The plates were washed three times with PBS–0.05% Tween 20, and rabbit anti-mouse IgG conjugated with horseradish peroxidase (DakoCytomation, Denmark) and diluted 1:3 000 was added, followed by incubation for 1 h at 37 °C OPD/H2O2 substrate [O-phenylenediamine dihydrochloride (Dako) and hydrogen peroxide] was used as the colorimetric reagent. The reaction was stopped by adding 0.1 mol/L sulfuric acid and plates were read at 450 nm to assess optical density on a microtiter plate reader (BioTek Instruments, USA),. To evaluate the cellular immune response in the immunized animal, mouse IL-6 and IL-12 ELISA Kit (Eastbiopharm, LTD, USA) were used. The protocol was applied based on manufacturer's recommendations. These kits use ELISA based on the double antibody biotin sandwich technique to assay the mouse IL-6 and IL-12. To diagnose serum IL-12, in brief, the serum of mice from all animals of different groups was added to the wells, which were pre-coated with IL-12 (IL-12/P40) monoclonal antibody and then incubated. After that, anti-IL-12/P40 antibodies tagged with biotin were added to incorporate with streptavidin–horseradish peroxidase to form an immune complex. After incubation, the enzymes without binding were removed and washed. A and B substrate are added. Then the solution would shift blue and change into yellow with the effect of stop solution (acid). For evaluation, blank well was taken as zero, the absorbance (OD) of each well was measured one to one under 450 nm of wavelength, which should be read within 10 min after adding the stop solution. The shades of a solution and the concentration of mouse interleukin 12 (IL-12/P40) are positively correlated. To diagnose IL-6, these instructions should be repeated exactly, with specific materials supplied in the mouse IL-6 ELISA kit. Two weeks after the second dose, the mice were intraperitoneal (I/ P) challenged with 200 μL of 24-hour growth of live P. multocida specific strain at 1×10-3 dilution (containing 1.5×107 CFU/mL, equivalent to 1 422 × LD50). Survivors were registered daily for 7 d.
The results are shown as the mean ± standard errors. Statistical analysis was performed using the Graph-Pad program PRISM 6.0. Distinctions between the control and treated groups were tested using a one-way variance analysis followed by Student's t-test for significance. The difference in level P<0.05 was statistically significant. P. multocida specific strain, which was grown in BHI and suspended in NSS, was completely inactivated with 0.5% formalin and 10 mmol/L FeCl3 for 24 h at 37 °C for the provision of FKA and IKA respectively. FKA, IKA, and bDNAs showed the absence of any bacterial contaminants when they grew on diverse media such as blood agar, nutrient agar, and BHI broth. All the vaccine preparations were completely devoid of live organisms. Chromosomal DNA extracted was found to be free from proteins and RNA as measured by A260/A280 ratio (=1.8). After phenol/ chloroform extraction, the bDNA concentration was found to be 250 ng/μL for P. multocida (A) strain, 210 ng/μL for P. multocida (B) strain and 320 ng/μL for S. typhimurium that were used as vaccine adjuvants. As a gauge of the vaccination ability to stimulate humoral immunity, ELISA was performed for serum specific antibodies to P. multocida on samples that were obtained 4 weeks after initial vaccination. All groups vaccinated with the whole-cell killed antigens stimulated humoral immunity by 4 weeks after initial vaccination. As shown in [Figure 1], strong humoral responses had been generated by the IKA-AbDNA and FKA-AbDNA vaccines respectively. After immunization, the serum antibody levels in the IKA-AbDNA and FKA-AbDNA groups were significantly higher than those in the FKA-Alum, IKA-BbDNA, IKA-SbDNA, and IKA vaccinated groups (P=0.019 9) and those in the negative control groups (P=0.009 3). There were no differences in the antibody levels between the IKA-BbDNA and IKA-SbDNA vaccinated groups. Figure 1: Dynamic changes in level of antibody in serum of immunized mice (n=8). Following the immunization, serum antibody levels were measured by indirect ELISA. The antibody level of immunized groups was statistically significantly higher than that of control groups (P=0.001 3). Two immune cytokines (IL-6 and IL-12) were detected after vaccination to investigate the cellular immune response of different immunogens. 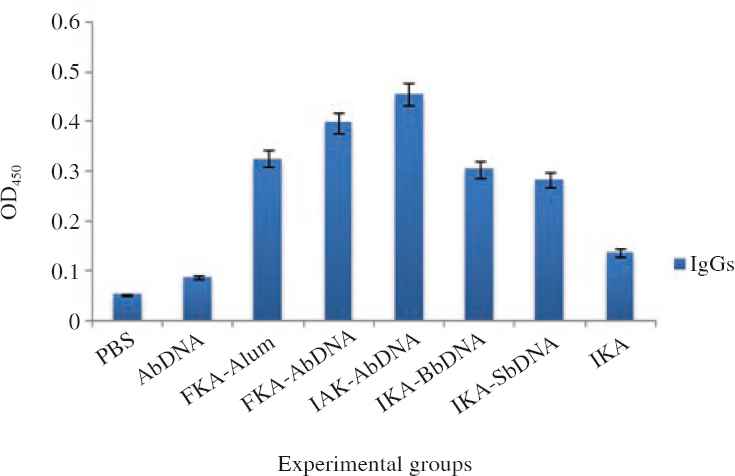 In the experiment, the IL-6 values were consistently higher in the FKA-Alum, FKA-AbDNA, IKA-AbDNA, IKA-BbDNA, and IKA-SbDNA groups than in the control group (P=0.006 7). 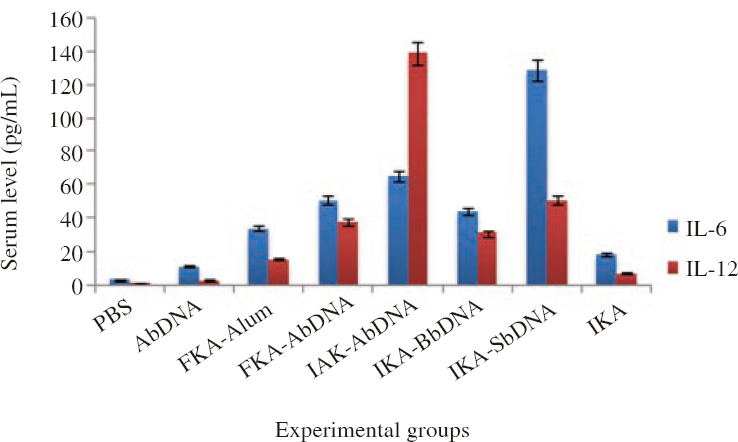 However, there were no differences in the IL-6 values among the groups of FKA-Alum, and FKA-AbDNA with IKA-AbDNA, IKA-BbDNA, and IKA-SbDNA vaccines (P=0.448 8) [Figure 2]. The results showed that IL-12 level in the IKA-AbDNA group was extremely statistically significantly higher than that in other immunized and control groups (P=0.000 1). Peak IL-6 and IL-12 titers were achieved in the IKA-SbDNA and IKA-AbDNA, respectively [Figure 2]. Figure 2: Production of IL-6 and IL-12 in mice detected by indirect ELISA (n=8). The IL-6 and IL-12 titer of bDNA adjuvanted groups was statistically significantly higher than that of Alum adjuvanted groups (P<0.05). Mice (five in each group) were challenged on day 28 (2 weeks after the second and final immunization) with P. multocida specific strain at a lethal dose of 1.5× 107 CFU/mL (I/P). Morbidity and death were monitored for 14 d post challenge. The survival rate of the PBS control, AbDNA, FKA-Alum, FKA-AbDNA, IKA-AbDNA, IKA-BbDNA, IKA-SbDNA, and IKA groups were 0%, 20%, 80%, 80%, 100%, 80%, 100%, and 40%, respectively. The results showed that mortality rate in the PBS, AbDNA, and IKA groups were higher than that in the killed whole-cell vaccine groups. None (0/5) of the PBS-immunized mice survived in the challenge, whilst nonspecific protection was observed in the mice immunized with FKA plus adjuvant (4/5; 80% protection) and IKA without adjuvant (2/5; 40% protection). The group immunized with IKA-BbDNA was not significantly protected compared to those immunized with IKA-AbDNA and IKA-SbDNA. In contrast, the group immunized with IKA-AbDNA was statistically significantly protected compared to the FKA-AbDNA group (P=0.029 9). The contradiction between IKA-AbDNA, IKA-BbDNA and IKA-SbDNA with IKA alone was significantly observed (P=0.023 7). The aims of vaccine development may be to prevent intensive infection or to control the disease with complications. In the current study, we investigated the adjuvant effect of several bDNA on the humoral and cellular immune responses both induced by immunization of Balb/c mice with the iron-inactivated and formalin-inactivated vaccine, as well as the protection against murine experimental pasteurellosis after vaccination. To inactivate virulent bacterial cultures for vaccine formulation which involves the use of formalin, heat, and acetone, several different methods have been used. Formaldehyde has been used in inactivation of bacteria and commonly used to prepare vaccines. Formaldehyde conditions vary from days to weeks depending on the bacteria, formaldehyde concentration and incubation situation (37 °C or 2–8 °C). Thus it may need to study an inactivation curve using chosen conditions choose to ensure that the bacteria get inactivated and maintain the immunogenicity or protective activity of the vaccine. Since the formaldehyde reaction is reversible, there is always a small amount of formaldehyde remaining in formaldehyde-prepared vaccines,. The use of iron as an inactivated agent rather than formalin has been reported by Kumar and Singh. They inactivated S. typhimurium with a high concentration of FeCl3 (>10 mmol/ L), producing toxic free-radicals for destroying bDNA and killing microorganisms for the modification of inactivated vaccines. In the present study, we inactivated P. multocida using 10 mmol/L FeCl3, which resulted in total inactivation of P. multocida during 24 h at 37 °C. We found that iron-inactivated vaccines were superior to formalin-killed preparations, especially when the bacterins were injected by bDNA adjuvants. Kumar and Singh showed that the vaccines prepared from iron-killed antigen+DNA can induce the humoral immune response and well protect mice against a virulent S. typhimurium strain. The humoral immune response is the significant factor in resistance to P. multocida infection. In this study, an ELISA test was performed to detect the levels of antibodies administered by the FKA and IKA inactivated vaccines and use of several adjuvants. Adjuvants can be used for varied purposes, including: to increase the immunogenicity of antigens highly purified or recombinant, to reduce the level of antigen or the number of immunizations required for immune protection, or to improve the potency of the vaccines in immuno-compromised persons, neonates or the elderly. Glenny et al. discovered that diphtheria toxoid precipitated with aluminum provided better immunogenicity than the toxoid alone. This pioneering study propelled the use of aluminum hydroxide or phosphate in vaccines as an adjuvant. Unfortunately, alum salts are comparatively weak adjuvants and scarcely produce cellular immune responses. Due to their strong immunostimulatory valence, materials derived from bacteria are main possible sources of adjuvants. Mycobacterial DNA adjuvant activity was increased that led to the detection of high levels of the CpG motifs adjuvant activity in the bacterial nucleic acids. A DNA containing CpG motifs that activate plasmacytoid dendritic cells and stimulate IFN-α production can be useful as a vaccine adjuvant,. All of the immunized mice produced antibodies to P. multocida antigens by ELISA. We found that the ability to stimulate the humoral immune response from two heterologous bDNA vaccines were inferior to that of a homologous bDNA vaccine. In this study, the highest antibody titers measured by ELISA were observed in IKA-AbDNA vaccine group compared to those in the IKA-BbDNA and IKA-SbDNA vaccine groups. These results indicate that homologous bDNA could stimulate better humoral immune responses than heterologous bDNAs and alum adjuvant. Kumar and Singh reported that homologous bDNA may act as a vaccine adjuvant and protect mice from S. typhimurium. Herath et al. showed that immunization of chickens with an iron-inactivated vaccine-5 μg bDNA increased IgY antibody levels more than iron-inactivated vaccine-10 μg bDNA. Thus, here we used 5 μg of pure bDNA alone or as an adjuvant in FKA and IKA vaccines. The cellular immune response also plays an influential role in the anti-infection process. Interestingly, the unique CpG motifs are recognized by toll-like receptor 9 localized in endosomes of B cells, plasmacytoid dendritic cells, myeloid dendritic cells, and macrophages, inducing inflammatory cytokines and immunoglobulins. IL-6 and IL-12 are crucial cytokines for the modulating of the safety of vaccination,. To determine whether mice have caused cell-mediated immunity to P. multocida, serum of five vaccinated and three control mice groups for controlling IL-6 and IL-12 were examined. In the present study, IKA-SbDNA and IKA-AbDNA inoculation significantly increased IL-6 and IL-12, respectively, in comparison to other immunized groups (P<0.05). These results showed DNA from some of the gram-negative bacteria such as Salmonella sp. bDNA can enhance the immune response caused by CpG motif against P. multocida infections. The effectiveness of experimental vaccines in mice was specified by lethal P. multocida specific strain challenge via I/P route. We found that vaccines adjuvant with bDNA gave better protection than vaccine adjuvant with alum and without adjuvant. The bDNA alone provided 20% protection, while none of the PBS group mice survived the lethal challenge. Mortality rate was 100% in the PBS control group, 80% in the AbDNA group, 20% in the FKA-Alum, FKA-AbDNA and IKA-BbDNA groups, 60% in the IKA group, and none of the mice died in groups IKA-AbDNA and IKA-SbDNA. Mortality in the groups FKA-Alum, FKA-AbDNA, IKA-BbDNA and IKA may be caused by insufficient immune stimulator of immunogens not enough, while 100% protection in the groups IKA-AbDNA and IKA-SbDNA can be related to the effects of immune modularity and immune stimulation of iron, AbDNA and SbDNA. Presumably, immunostimulatory effect of SbDNA is because of that Salmonella has un-genus heterologous bDNA for the preparation of P. multocida vaccine. Herath et al. found that iron-inactivated vaccine-10 μg bDNA vaccine gave 100% protection in chickens and then iron-inactivated vaccine-5 μg bDNA protected 75%. The FIV-Alum vaccine provided only 62.5% protection. They showed that, although at the time of the challenge, the antibody titer was almost identical in all vaccinated chickens, only the IIV-10 μg bDNA vaccine could increase chickens survival. In conclusion, the present study has developed an antigenic and protective effect of bDNA. The results showed that the iron-killed vaccines and, secondly, formalin-killed vaccine offered a good immunity against P. multocida. Mice immunized with bDNA showed significantly stronger immune responses as in the current trials in comparison to control. In our study for the first time, the new vaccine formulation (IKA-SbDNA) was successfully tested in Balb/c mice. DNA acted as an adjuvant to enhance the humoral and cellular immune responses against challenge with virulent P. multocida specific strain. The authors would like to thank Dr. M. Hayati and Dr. M. Namavari for their cooperation and help during this work. Nassar SA, Mohamed AH, Soufy H, Nasr SM. Protective effect of Egyptian propolis against rabbit pasteurellosis. Biomed Res Int 2013; 3: 1-9. Wu C, Qin X, Li P, Pan T, Ren W, Li N, et al. Transcriptomic analysis on responses of murine lungs to Pasteurella multocida infection. Front Cell Infect Microbiol 2017; 7: 251. Wilson BA, Ho M. Pasteurella multocida: From zoonosis to cellular microbiology. Clin Microbiol Rev 2013; 26(3): 631-655. Furian TQ, Borges KA, Laviniki V, Rocha SLS, Almeida CN, Nascimento VP, et al. Virulence genes and antimicrobial resistance of Pasteurella multocida isolated from poultry andswine. BJM 2016; 47(1): 210-216. Shivachandra SB, Kumar A, Yogisharadhya R, Viswas KN. Immunogenicity of highly conserved recombinant VacJ outer membrane lipoprotein of Pasteurella multocida. Vaccine 2014; 32(2): 290-296. Silveira M, Vargas S, Mendonça M, Cunha CE, Hartwig D, Seixas A. Xanthan gum enhances humoral immune response elicited by a DNA vaccine against leptospirosis in mice. BMC Proceed 2014; 8(4): 153. Radhi SN. Optimization of heavy metals chlorides resistance by Staphylococcus aureus and its ability to remove them. IJS 2012; 53(4): 778-785. Gupta A, Chaphalkar SR. Vaccine adjuvants, the current necessary of life. Shiraz E Med J 2015; 16(7): 1-11. Erika Freitas E, Marinho AC, Albuquerque D, Teles L, Sindeaux M, Salles MT, et al. Adjuvant activity of peanut, cottonseed and rice oils on cellular and humoral response. Vaccimonitor 2013; 22(1): 4-9. Petrovsky N, Aguilar JC. Vaccine adjuvants: Current state and future trends. Immunol Cell Biol 2004; 82(5): 488-496. Kobiyama K, Jounai N, Aoshi T, Tozuka M, Takeshita F, Coban C, et al. Innate immune signaling by, and genetic adjuvants for DNA vaccination. Vaccines 2013; 1(3):278-292. Iho S, Maeyama J, Suzuki F. CpG oligodeoxynucleotides as mucosal adjuvants. Hum Vaccin Immunother 2015; 11(3): 755-760. Okay S, Özcengiz E, Gürsel I, Özcengiz G. Immunogenicity and protective efficacy of the recombinant Pasteurella lipoprotein E and outer membrane protein H from Pasteurella multocida A:3 in mice. Res Vet Sci 2012; 93(3): 1261-1265. Schmidt M, Hagner N, Marco A, König-Merediz SA, Schroff M, Wittig B. Design and structural requirements of the potent and safe TLR-9 agonistic immunomodulator MGN1703. Nucleic Acid Ther 2015; 25(3): 130-140. Hanagata N. CpG oligodeoxynucleotide nanomedicines for the prophylaxis or treatment of cancers, infectious diseases, and allergies. Int J Nanomedicine 2017; 12: 515-531. Tahamtan Y, Amrabadi O, Shahryari R. Identification of Pasteurella multocida and molecular diagnosis of haemorrhagic septicaemia in Iranian camels. Revue Med Vet 2016; 167(5-6): 126-132. Herath C, Kumar P, Singh M, Kumar D, Ramakrishnan S, Goswami TK, et al. Experimental iron-inactivated Pasteurella multocida A:1 vaccine adjuvanted with bacterial DNA is safe and protects chickens from fowl cholera. Vaccine 2010; 28(11): 2284-2289. Kumar D, Singh A. Salmonella typhimurium grown in iron-rich media, inactivated with ferric chloride and adjuvanted with homologous bacterial DNA is potent and efficacious vaccine in mice. Vaccine 2005; 23(48-49): 5590-5598. Cheng HR, Jiang N. Extremely rapid extraction of DNA from bacteria and yeasts. Biotechnol Lett 2006; 28(1): 55-59. Oliveira CF, Paim TG, Reiter KC, Rieger A, D'Azevedo PA. Evaluation of four different DNA extraction methods in coagulase-negative Staphylococci clinical isolates. Rev Inst Med Trop Sao Paulo 2014; 6(1): 29-33. Bacelo KL, Hartwig DD, Seixas FK, Schuch R, Moreira AS, Amaral M, et al. Xanthan gum as an adjuvant in a subunit vaccine preparation against leptospirosis. Biomed Res Int 2014; 2014: 1-10. Gong Q, Qu N, Niu MF, Qin CL. Evaluation of immunogenicity and protective efficacy of recombinant ptfA of avian Pasteurella multocida. IJVR 2016; 17(2): 84-88. Roetzera A, Bernd Jilmab B, Eibl MM. Vaccine against toxic shock syndrome in a first-in-man clinical trial. Expert Rev Vaccines 2017; 16(2): 81-83. Kaminski RW, Wu M, Turbyfill KR, Clarkson K, Tai B, Bourgeois AL, et al. Development and preclinical evaluation of a trivalent, formalin-inactivated Shigella whole-cell vaccine. Clin Vaccine Immunol 2014; 21(3): 366-382. He P, Zou Y, Hu Z. Advances in aluminum hydroxide-based adjuvant research and its mechanism. Hum Vaccin Immunother 2015; 11(2): 477-488. Gong Q, Qin CL, Niu MF, Cheng M, Sun XF, Zhang AG. Immune efficacy of OmpH and OmpA DNA vaccines against avian Pasteurella multocida. IJVR 2013; 14(3): 197-202.